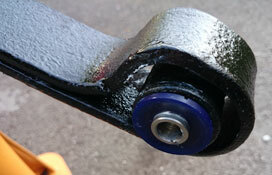 Above before refurbishment (painted and polyurethane bushes fitted), and below after. The car sat evenly, so I decided that no further refurbishment was necessary. 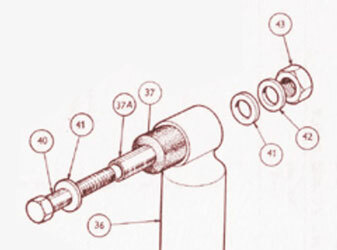 The rear shock absorbers had been replaced by Armstrong Red Max adjustable ones in 1981. I originally intended to restore these by sanding down and painting, as they are quite rare, but when I started to clean one up, it had several dinges I hadn't noticed before so I decided to buy some new ones. Konis are the best (they have been fitted at the front) but they have discontinued those for the rear, so I decided to get Spax. Why Spax? Well, I had thought of AVOs (promoted by Jigsaw) or GAZ, all of which are made in the UK and I am sure are excellent. I decided on Spax purely because on reading an article in Classic & Sportscar on the Bristol Britannia (Sept 2017) Bristol had switched from Koni to Spax. 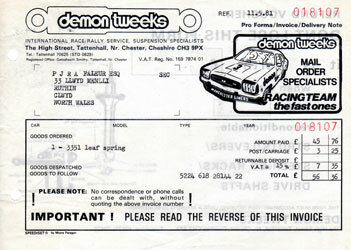 I thought if they are good enough for a £46,000 Bristol, they are good enough for my Triumph! Above are the new Spax and old Armstrong shock absorbers. 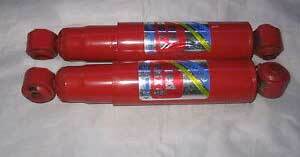 Below are a picture of a pair of Red Max shock absorbers which were recently on eBay. The thick washers which go on either side of the mountings (Plain Washer - 1/2 X 1 3/8, 41 below) are no longer available, so I bought some equivalent stainless metric ones (13mm x 35mm).